Background: Acyl glucuronides of xenobiotics have been a subject of wide interest from the pharmaceutical industry with respect to biochemical reactivity, hepatic disposition, and enterohepatic circulation. The reactivity and lack of stability of an acyl glucuronide for a clinical candidate could pose major developability concerns. To date, multiple in vitro assays have been published to assess the risk associated with acyl glucuronides. Despite this fact, the translation of these findings to predicting clinical safety remains poor. Methods: In the present investigation, we aimed to provide simplified in vitro strategy to understand the bioactivation potential of acyl glucuronides of 10 commercial, carboxylic acid containing drugs that have been categorized as “safe,” “warning,” or “withdrawn” with respect to their marketed use. Acyl migration was measured as a function of the number of peaks observed in LC-MSn analysis. In addition, we carried out reactive intermediate trapping studies with glutathione and methoxylamine to identify the key intermediates in the transacylation bioactivation and glycation pathways, respectively. We also conducted reaction phenotyping with recombinant UDP-glucuronosyltransferase (UGT) Supersomes® to investigate if the formation of acyl glucuronides could be linked to specific UGT isoform(s). Results: Our results were in line with reported values in the literature. Our assay could be used in discovery research where half-life calculation completely eliminated the need to chemically synthesize the acyl glucuronide standard for risk assessment. We captured our results for risk assessment in a flow chart to simplify the various complex in vitro techniques historically presented. Conclusion: While the compounds tested from “withdrawn” and “warning category” all formed the glutathione adduct in buffer, none from “safe” category formed the glutathione adduct. In contrast, none of the compounds tested from any category formed methoxylamine conjugate, a reaction with putative aldehyde moiety formed via acyl migration. 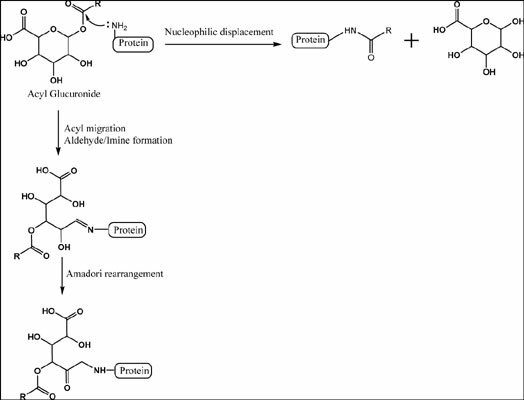 These results, highly favor the nucleophilic displacement as a cause of the reactivity rather than the acyl migration via aldehyde formation. The workflow presented could also be applied in the discovery setting to triage new chemical entities of interest. UGT, acyl glucuronides, glucuronidation, reactivity, stability, bioactivation, thioacyl glutathione, methoxylamine.